2014 is shaping up to be a big year for Houdini in popular culture. Not only are we seeing new novels, plays, a documentary and a miniseries, but now comes word of two new additions to the growing sub-catagory of Houdini animal adventures. First up: Screen Daily reports that Circus Road and Canal Street Films will begin filming Houdini in Los Angeles in September. 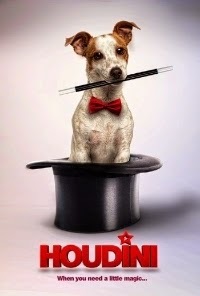 The family film directed by William Dear from a script by Marty Colasuonno and Julian Ericsonn centers on "a young magician trying to save his family's animal rescue shelter with the help of a famous escape artist dog on the run from kidnappers." "We are thrilled that Bill Dear has agreed to direct," said Circus Road founder Glen Reynolds. "We are big fans of his films and we believe he will deliver a great movie." Next: Amazon has a new listing for a book called Orangutan Houdini by Laurel Neme. This illustrated children's book tells the true story of an orangutan named Fu Manchu "who escapes his enclosure at will and spends sunny days with the elephants in another part of the zoo." The book will be released by Bunker Hill on September 17, 2014. Below is the official book trailer.